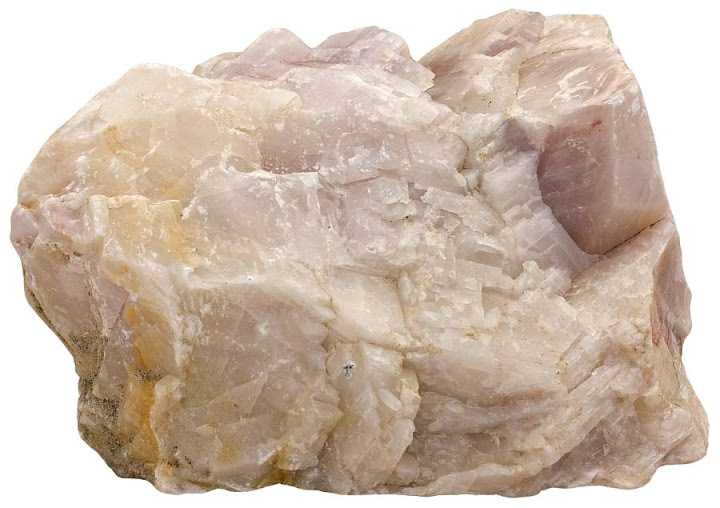 Calcite is one of the most common and widespread minerals. It is a principal component of most sedimentary carbonate rocks (limestone, chalk, travertine, etc.) but occurs in metamorphic (marble, hydrothermal veins) and igneous rocks (carbonatite) also. The mineral is typically light-colored and large crystals have well-developed crystal faces. Width of sample 12 cm. TUG 1608-2690. It (CaCO3) usually forms anhedral (without well-developed crystal faces) grains in limestone and marble. In marble, crystals are usually larger, but some limestones (grainstones) may be pretty coarse as well and are therefore sometimes erroneously called marble as well (mostly for marketing purposes). 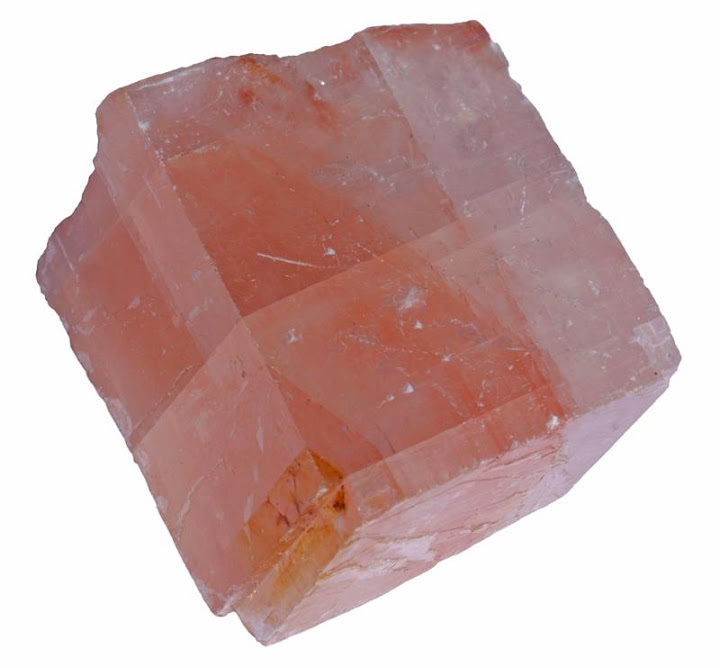 Calcite is also a cementing mineral in clastic sediments and an important biomineral. Microorganisms with calcareous tests usually prefer aragonite (chemically also calcium carbonate), but as time goes by these aragonitic shells recrystallize to calcite. It may form as a direct chemical precipitate (travertine) or as a gangue mineral in veins, but most of it is somehow connected to life. The mineralization may be directly biologically controlled (growth of shells), but also biologically induced (blooms of drifting marine microorganisms that induce the crystallization of calcite crystals on their surface), which results in whitish tropical water and contributes to the growth of carbonate banks. Calcite in metamorphic rocks is sometimes associated with calc-silicate minerals. These are silicate minerals that contain lots of calcium and are the products of chemical reactions between carbonate rocks and hot silicate (magmatic) liquids. Such rocks are called skarns. 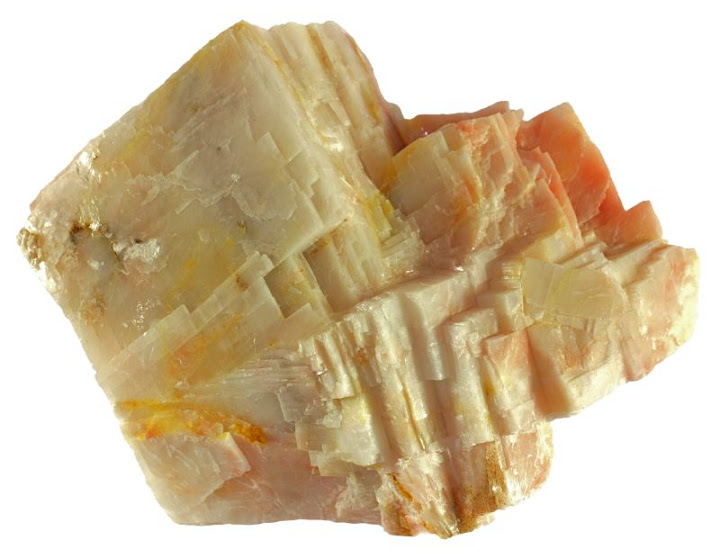 Calcite is not a common mineral in igneous rocks, but it may occur in alkali-rich (high Na- and K-content) rocks containing feldspathoids like nepheline or sodalite. Carbonatite is a rare and still somewhat mysterious igneous rock that is usually composed mostly of calcite. It is an important industrial mineral with many uses. It is a principal raw material in cement industry. Intense heating will drive off carbon dioxide and produce quicklime (CaO). Quicklime and hydrated lime can be used in many ways: as a mortar, flux in metallurgy, filler in paper, soil stabilization, sugar refining, wastewater treatment, and in dietary supplement pills because calcium is a major macromineral (note that the term “mineral” has a different meaning here, chemical element calcium is no mineral in a geological sense because it is highly reactive and therefore does not occur alone). Calcite crystal demonstrating typical rhombohedral shape. Width of sample is 5 cm. Calcite from skarn. Tapuli, Sweden. Width of sample 8 cm. Limestone is mostly composed of very small anhedral calcite crystals. 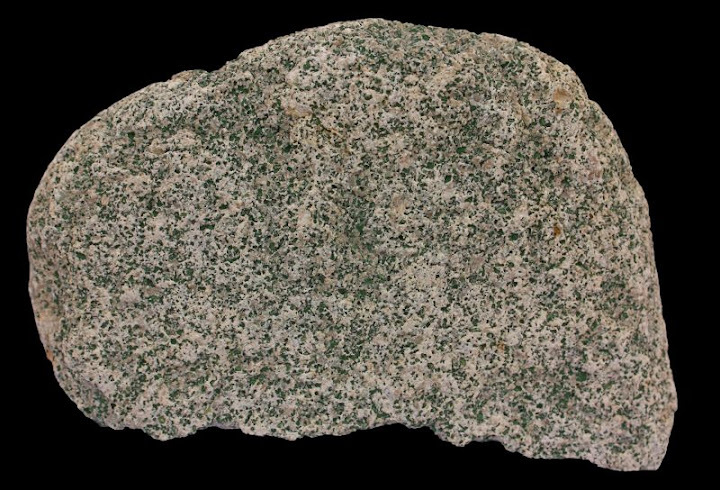 Green spots are glauconite grains. The width of the glauconite limestone sample from Estonia is 13 cm. 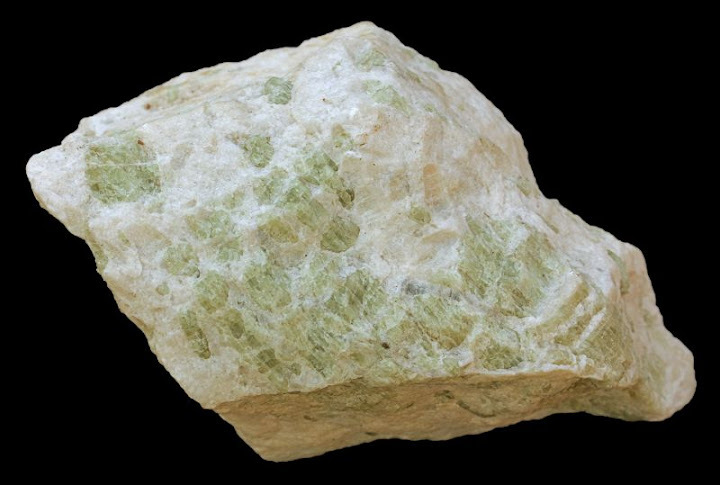 An igneous rock carbonatite consisting of white calcite and green apatite from Siilinjärvi, Finland. Width of sample is 11 cm. Brecciated travertine (chemically precipitated hard limestone) in Death Valley. Width of view 30 cm. Tufa towers of Mono Lake in California. These tufa towers are primarily made of calcite. Marble is a common metamorphic rock which is mostly composed of calcite. Baikal, Siberia. Width of sample 12 cm. Many marine organisms secrete it to build hard exoskeletons. Chalk is a friable rock type that is composed of tiny shells of algae named coccolithophores. Width of sample 6 cm. I could easily mistake the last example with a serpentine marble. Yes, similar colors. I should have a photo of serpentine marble somewhere also but not yet prepared to be published. I collected this carbonatite sample in Finland (Siilinjärvi mine) few years ago. A nickname for some sand found in Florida is “sugar sand”. It is characterized by small grainsize, minimal aggregation, very low compaction, and poor capture of organic material. What is the proper technical name for this type of sand, and what (if anything) can be done to improve its compaction and ability to hold organic material?